I have not updated my reading list for a while. The mainly reason is that I have been too busy these days, no time to read, no time to put the link even if I had read. However, if you note the upper right corner of my blog, you could still see that I have updated the readling list from time to time. Today, there were 2 great posts (both in Chinese) that I would like to recommend. I had wanted to write about these 2 issues for quite some time, and am glad that I do not have to now. There are some critical writers in HK. 2) Is Christine Luk stupid, or ? The second link about some ridiculous propaganda from a HK think tank, headed by democrat Christine Luk. Ms Luk is a British trained lawyer, and also a veteran commodity trader who traded commodity perhaps before the famed Apple Daily Petroleum Analyst Pakman was born. :). She is definitely not stupid. So why did she made such an obvious mistake? What is her motive? So much noise, and I thought no one would speak out in HK. I am glad that the people in HK are not all blind and have cirtical minds. Lastly, talking about local media, on Tuesday's column (June 26 - I have the pdf format but do not know how to convert into jpg or post here - please advise) Lam Hang-chi of HK Economic Journal wrote about the (pseduo)-"coincidence" that many great economists are trained in some other disciplines, mostly in maths or physics. I do have one theory, viz, undergraduate economic textbooks are simple dull and boring. It is hard for such course to attract the brightest minds. I sat in a few undergraduate economic classes at one of the very top Ivy League college taught by star professors, I wanted to sleep. I tried to read Economic textbooks, I never really gone pass the demand/supply curve chapters. Lam made a small factual error though. He said the only couple that both won Nobel prize is Mr and Mrs Myrdal, in Economic and Peace. Not true. Mr and Mrs Curie shared the Physics Prize in 1903. In fact the Curie family collect 4 medals together. Lam also forgot the now famous John Nash, who is not only not trained as an economist, but never been a real economist. "Great spirits have always encountered opposition from mediocre minds. The mediocre mind is incapable of understanding the man who refuses to bow blindly to conventional prejudices and chooses instead to express his opinions courageously and honestly. " 2) I am glad that Apple Daily is courageous enough to publish these 2 great essays on the same day, both are critical of Jimmy Lai's political allies, the democrats. Kudos to Mr Lai, or more precisely, the AD editor. I have to say, AD has recovered from the Liu Kinming fiasco and regained credibility and my respect. I am sure it will be much more effective media to achieve whatever Mr Lai wants to achieve, by being rational, fair, factual, and balanced. 3) To illustrate why it is important to read critically, read this timely link via ESWN. 1) it took millions of Americans - the great men who wrote the constitution, Abraham Lincoln, millions who died in the two world wars to liberate the world - more than 200 years to win the good will of Mr. Aslam Abdullah to say (A), voluntarily. Can't find our enemy? create some so that we have a war to fight. This is the dreamland for arms dealers. How was Sun Zi taught in West Point? Go figure. Sorry, too busy to blog. But I would recommend this post by Sidekick. Supergirl finally got a sequel. It is called "Super Avenue of Stars", a similar singing contest in Taiwan, produced by Huang Zongwei, the producer of the celebrated Mengguo. The key element that deviates from Supergirl is that in SAS there is a challenger session, where the challenger can pick one of the finalists and replace him. The germ in SAS is that there is a really good challenger, who is arguably as good as or even better than the best incumbent. He chose to fight the toughest battle, by choosing to challenge the incumbent leader and sing the song the incumbent has sang, winning 2 round before lost in a controversial final round of challenge, and -- you got it right, CRIED! That was a touching scene. The common theme for the Supergirls and Superboys is that they all like to cry. Because of this show, an old song became a new hit in Taiwan. There is more in Taiwan than corrupted politicians, political bickering, or dumb money diplomacy. It is still a beautiful island. The HK Observatory must have missed the controversy it stirred last year. As it is making noise again. The new story? -- No winter in HK in half a century. Yeah, right, global warming, skyscraper trapping heat and that. I just do not believe these linear projections. People also said, China's GDP/cap grows at 10% p.a., at this rate it will surpass that of US in 20 year ( (50000/7000) at 10% p.a.-- PPP) or 33 years (log(50000/2000)/log(1.1) at nominal). There's got to be some negative feedback (i.e. self correcting) factor in any system, especially so as HK is not a close system by itself. It has only 1050km2 of land where the so-called "skyscraper trapping effect" is only applicable to some 20% of the area. As for the global trend in "warming", let's also remember that it is far from conclusive (see the other side of the argument). Furthermore, it may not be just global. It may be pan-solar-system. e.g., The temperature in Mars has risen by a comparable amount during the same period. Maybe Mr Lam is trying to be funny. He said, "We would really start losing the very distinct seasonal march throughout the year". I watched a beautiful movie in the plane 2 months ago, the Painted Veil. Great lead actor and actress, splendid cinematography and that. I love the movie. Shanghai belongs to the Yangtze River System, while Guilin belongs to the Pearl River System. Today the estuaries of these 2 systems form the most vibrant economic zones in China, the Yangtze Delta and the Pearl Delta. 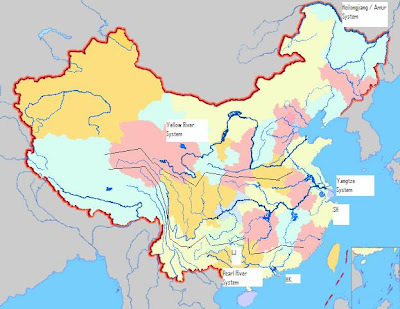 Smaller river systems such as Min Jiang in Fujian, etc. Coincidentally, if the film-makers were to follow the settings of the original book, the city Walter lives would be HK, not Shanghai. 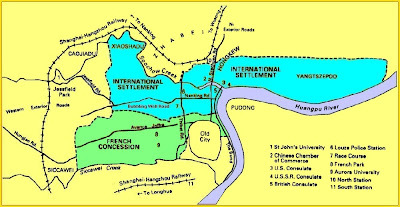 One would then be able to sail from HK upstream to Li Jiang in Guilin (via Guangzhou/Pearl River, Wuzhou/Xi Jiang/Guijiang and finally reach Li Jiang (LJ in the map). 2) There is actually a canal, Ling Qu, built by Qin Shihuangdi, connecting the Pearl and Yangtze systems. But it is unlikely that one would take a boat from Shanghai to Guilin via Ling Qu. I blogged about the BT case in HK some 18 months ago. Today a link to this great essay below was sent through to me -- strange link via the commentary of a totally unrelated blogpost (couldn't find it in either author's orginal blog), but a very nice surprise that it is written by one of the smartest artists in HK, and yes, there are smart artists in HK. I discussed about the cost of China's cautiousness towards political reform before. Now Jimmy Lai of Apple Daily suggested a baby step for the leadership in Beijing to test the water, by trying HK.